And the radius is the distance b/w (-4, -1) and (0,0) or the distance b/w (4, 1) and (0,0). Radius r is So the circle equation is x2 + y2 =17. Multiplied by 4, the equation is - 2x + y = -4. so y = 2x - 4. 3. parallel line has same slope as 4x - 3y =7, that is m = 4/3. 5. The given equation solving for y is y = -6x +10. So the perpendicular slope is 1/6. 7. 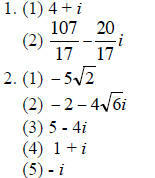 (1) Two point from the given condition are (8, 0.21) and (15, 4.75). (2) In 2010, t =20. The cash flow per share is $8.01. (3) Denominator ≠ 0; x2 + x -12 = 0; x = -4, 3; All real number but - 4, 3. (4) 9x - 3 ≠ 0, at the same time 9x - 3 ≥ 0. So withouth equality sign , x > 1/3 . There is one zero which is 0.75550951. (1) h(-2.3) = [[ 3(-2.3) – 1 ]] + 2 = [[ -6.9 – 1 ]] + 2 = [[ -7.9 ]] + 2 = -8 + 2 = -6. (2) h(3.1) = [[ 3(3.1) - 1]] + 2 = [[ 9.3 – 1 ]] + 2 = [[ 8.3 ]] + 2 = 8 + 2 = 10. 1. 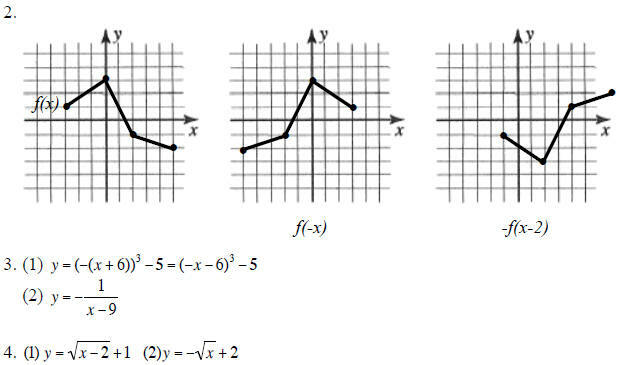 (1) Yes, b/c domain is restricted the graph shows only half of the function. 4. You don’t even need to consider what the given function is. should be symmetry to y=x. 1. (1) The vertex is (2,4) and it’s parabola open downward passing through (0,0). (2) Odd multiplicity: crossing x- axis, starting from right lower corner . 5. False -4/7 is a zero. 6. Using synthetic division, remainder should be zero; your remainder should be c + 210.
is not defined at x = 0, 2 but y = x is. asymptote graph is not toughing or passing through). So the limiting size is 1500.
and the other is y = 2.